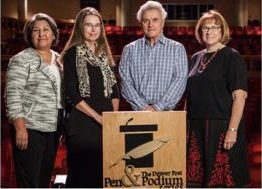 At the opening of its Pen & Podium Series, The Denver Post Community Foundation presented special guests from Colorado Humanities with a $5,000 grant to support the Motheread/Fatheread Colorado program. Colorado Humanities is one of five organizations focused on literacy to be recognized by the Series this year. Shown here is world-renowned author John Iriving, the Series’ first speaker for 2017 on hand to congratulate Colorado Humanities Executive Director Maggie Coval, Program Director Josephine Jones, and Motheread/Fatheread Colorado Program Coordinator Vera Atilano. Copyright © 2018 Colorado Humanities. All rights reserved.